JUSTICE LEAGUE #15 Will Conrad VARIANT DC comics NM 2019 Snyder ⭐⭐⭐ 3 LEFT! JUSTICE LEAGUE #15 DC comics NM 2019. Release Date: January 9, 2019. Will Conrad VARIANT. Cover Artist: Will Conrad. From DC from 2014------------------------------------ --- ---- --- - ------ ------ Written by Tom Taylor. Art by Mike S. Miller, Bruno Redondo and Xermanico. These Comics Are Signed By None Other Than Jerry Ordway And Numbered 240 Out Of 500. These Comics Are All In Very Fine/Very Fine (8.0-8.5) Condition. Don't Miss Your Chance At Getting These Amazing Comics For A Great Price. Most comics are in NM condition. VARIANT ITEM IS IN AN ESTIMATED CONDITION OF NEAR MINT . WE FREQUENTLY ATTEND CONVENTIONS. We're sorry but no exceptions will be made to that rule. The more you buy the more you save! We will be glad to assist you in working through the right channels to resolve the issue. Gorgeous High Grade Copy. A Very Desirable Beautiful Copy With Outstanding Eye Appeal - White Pages - Lies Flat - Staples Bright & Shiny - Corners Sharp & Square - No Spine Stress Lines. A Copy In This Grade Has All Pages And Covers, Although The May Be Small Pieces Missing. WONDER WOMAN #63 SHIRAHAMA VARIANT. VARIANT ITEM IS IN AN ESTIMATED CONDITION OF NEAR MINT OR BETTER . WE FREQUENTLY ATTEND CONVENTIONS. We're sorry but no exceptions will be made to that rule. The more you buy the more you save! This is a copy of Justice League Dark and Wonder Woman #1. Comic is in NM condition and comes bagged and boarded. Justice League Dark #2 - CGC 9.8 NM/MT - DC 2018 - Greg Capullo Variant Cover! Title, Number = Justice League Dark #2 (Capullo Variant). Significance = Amazing Greg Capullo variant cover! Publisher, Date = DC - 2018. ALWAYS be the book you receive. What you see in the pictures will. 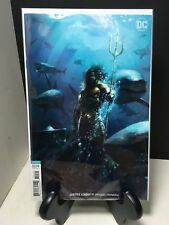 This is a first print ofJustice League #11 (2018; NM/NM-) from DC. UP FOR SALE: 2017 DC COMICS / GENERAL MILLS CEREAL : JUSTICE LEAGUE #1-4 MINI COMIC BOOK SET --- TOUGH SET TO COMPLETE --- GREAT ODDBALL COLLECTIBLE --- HARD TO FIND. YOU GET COMIC BOOKS PICTURED. Terry and Rachel Dodson variant. Cover Artist: Terry and Rachel Dodson. JUSTICE LEAGUE: ODYSSEY #4 DC comics NM 2019. Release Date: January 2, 2019. Writer: Joshua Williamson. JUSTICE LEAGUE # 12 NM. SUPAH GRRRL . We have lots of other comics as well. David Mack Variant. - Publisher: DC Comics. - Comic Book Grade: NM condition. - Year Published: 2010. DC Justice League Dark 2,3,4 Cover A and the Wonder Woman Witching Hour #1 Federici Variant. All of these are unread and in excellent shape. Up for sale is a JLA Classified # 1. 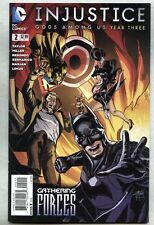 Up for sale is Justice League Dark #5 and it's in near mint- condition. I have graded this to the best of my ability using the comic book grading scale attached below. However, I am not a professional grader and grading is subjective. Signed by Tony Daniel, 169 out of 325. NM never opened, Dynamic Forces seal still intact. I am NOT a professional grader. This comic is signed by the writer, Adam Beechen! This comic is the 1st print. Rare HTF premiere issue of Convergence: Justice League of America #1. Signed by Fabian Nicieza (with Dynamic Forces Certificate of Authenticity)! This comic is in roughly NM- condition (not a professional grader). Please refer to pics for condition as they are the actual comics you will receive (or email for additional photos/info). Ships securely in a Gemini Mailer with bag and board! If you decide to buy and are pleased with your purchase, positive feedback is always appreciated. Signed Greg Capullo. JUSTICE LEAGUE DARK #1 1:50 Variant cover will have a black and white cover featuring the variant cover art by Greg Capullo and Jonathan Glapion orderable under item code MAY189265. Henry Cavill signed comic book. Henry signed this comic book on 07/18/2018 after a talk show appearance in Hollywood, CA. Signature is 100% authentic and will pass any authentication services or your money BACK. JUSTICE LEAGUE #1 + JIM LEE VARIANT Signed By SCOTT SNYDER! NM! JUSTICE LEAGUE #1 JIM LEE VARIANT Signed By SCOTT SNYDER! NM! You are purchasing two copies of Justice League #1, regular cover and the Jim Lee variant. Bothe copies have been signed by Scott Snyder and come with a COA. Please see pictures for reference. If you need more pictures, please ask. Book will be shipped securely. I want it to arrive the same way it left. Please ask if you have any questions. Thanks for checking out this listing! “THE TOTALITY” part one! Comics legends Scott Snyder and Jim Cheung launch the Justice League into a cosmos-shaking mystery that will draw out their most terrible foes…in ways our heroes couldn’t possibly imagine! Justice League Dark and Wonder Woman: The Witching Hour #1 Federici Variant. Shipped with USPS First Class Package. Please examine photos to determine your own opinion as to condition. I have never opened this book and it has been bagged and boarded as long as I’ve owned it. Shipped media mail unless other arrangements are made. Special Notes: This issue is a First Printing! Publication Date: July, 2016 (The date in the title refers to the year the title started). Writer: Geoff Johns. Cover Artist: Gary Frank. Issues 27 - 29. (I rarely grade better than VF/NM even when the comic is obviously a better grade). VF/NM or Better! Image is of actual item listed. This is DC Universe Rebirth #1 1/100 RI variant cover by Ivan Reis released by DC Comics in 2016. The cover is signed by Gary Frank and Joe Prado. NO COA IS INCLUDED. Nearly perfect with outstanding eye appeal. THIS AUCTION IS FOR A VF/NM COPY OF DC UNIVERSE REBIRTH FIRST PRINT SIGNED BY PHIL JIMENEZ AND ETHAN VAN SCIVER WITH A CERTIFICATE OF AUTHENTICITY FROM MIDTOWN COMICS. SHIPPING IS FREE. I ACCEPT PAYPAL. DC Comics, first printing. We are not professional graders and we will not issue a grade for the comic listed. This comic is signed by Humberto Ramos! This comic is the 1st print. JUSTICE LEAGUE DARK #6 Clayton Crain VARIANT DC comics NM 2018 ☠️ ☠️ ☠️ 1 LEFT! Clayton Crain VARIANT. Cover Artist: Clayton Crain. JUSTICE LEAGUE DARK #6 DC comics NM 2018. Release Date: December 12, 2018. The Justice League Dark.trapped in the mystic realm of Myrra! Their jailer?. 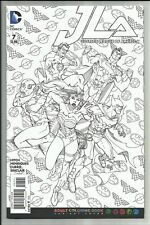 JUSTICE LEAGUE #10 JIM LEE VARIANT COVER -SIGNED BY SUPERSTAR WRITER SCOTT SNYDER! COMES WITH A MIDTOWN COMICS COA! NM 9.6 CONDITION - REALLY NICE COPY! Buyer to pay $5.00 shipping - ships well protected in comic-specific mailer. I accept Paypal. VF or Better! (I rarely grade better than VF/NM even when the comic is obviously a better grade). JUSTICE LEAGUE DARK #7 DC comics NM 2019. Release Date: January 16, 2019. Kelley Jones variant. Cover Artist: Kelley Jones. Publisher: DC Comics. Justice League #1 Houston Strong NM signed Jim Lee, Geoff Johns, Dan Didio. Justice League #1 Houston Strong exclusive variant. Signed by Jim Lee, Geoff Johns, and Dan Didio. NM. Only 1,000 copies of this book were ever printed. Extremely rare collectible. No other listings have 3 signatures. They only have 2. Comes from smoke free environment. Justice League: Odyssey #1 NM- 9.2 Cover B Variant DC Comics $4 Flat-Rate Ship! 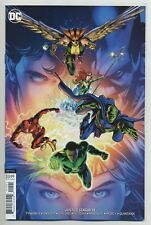 Up for sale is Justice League Odyssey #1 and it's in near mint- condition. I have graded this to the best of my ability using the comic book grading scale attached below. However, I am not a professional grader and grading is subjective. Sears’ work has been featured in comics for every major and many independent publishers. Inside art - Pencils: Keith Giffen (breakdowns); Bart Sears, Inks: John Beatty; Randy Elliott. Maxwell Lord has been shot, and both teams have been ordered to disband by the United Nations. ENERGY AND SAFETY ADVENTURES WITH THE JLA CON EDISON GIVEAWAY 2008 SUPERMAN VF . Shipped with USPS First Class Package. Clayton Crain Variant. VARIANT ITEM IS IN AN ESTIMATED CONDITION OF NEAR MINT . Justice League Dark#5. We're sorry but no exceptions will be made to that rule. The more you buy the more you save! If your e-Check fails to clear on its first attempt, your order may be cancelled.